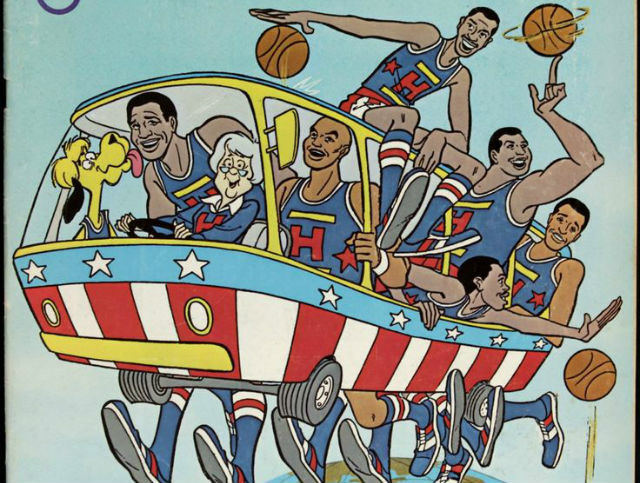 This week’s minorities in cartoons entry is the Harlem Globetrotters. The famed basketball team, founded in 1927, has become famous for their acrobatics on the basketball court. Said fame even led to becoming cartoon characters. The series, produced by Hanna-Barbera, kept with the then-new formula of “traveling group meets up with trouble around the world and solves it with their unique skills.” In this case, the Globetrotters’ basketball skills. In the late 70s, the Globetrotters appeared again in another Hanna-Barbera animated series, this time on NBC. 1979’s “The Super Globetrotters” featured the team as a group of superheroes. Three of the members possessed powers/costumes resembling those of mid-60s Hanna-Barbera series “The Impossibles.” A somewhat different cast was present for this series (reflecting the changes in the real-life Globetrotters team’s roster). The show lasted for one season. One episode of “Futurama” portrays the team as beings from another planet. An episode of “Pinky and the Brain” (the episode “Brain’s Song”) mentioned Globetrotter star Meadowlark Lemon. As of this writing, 1979’s “Super Globetrotters” has been released to DVD, though the original series remains absent. The team’s appearances on “The New Scooby-Doo Movies” are all available on DVD on a one-disc release titled “Scooby-Doo Meets the Harlem Globetrotters.” Due to rights related issues, the episodes weren’t included in the actual “Best of The New Scooby-Doo Movies” DVD box set, hence the “Best of” title. The “Simpsons,” “Pinky and the Brain,” “Fairly Odd Parents,” and “Futurama” episodes referencing the Globetrotters are available on DVD as part of those shows’ season box sets. Looney Tunes is getting a direct-to-video film, "Rabbits Run"
Next Post:Non-canonical Superman comic to debut; debut stories written by…Orson Scott Card? !